Ahhhh, it’s nice to be back. Back on the streets of Chicago. Yesterday afternoon I went out style hunting for the first time in what felt like ages. Even street-style photographers need breaks. I hate the brouhaha that surrounds Christmas shopping and besides, it’s impossible to set up shots on the crowded sidewalks. I spotted Jess and her friend Chris during a return to my old stomping grounds on Rush Street. They were visiting Chicago from Australia. I give tourists a hard time but really, more often than not visitors from overseas are among the best dressed people on the sidewalk. I mean, if you are cultured enough to enjoy traveling then you probably also understand the importance of dressing well. What I thought Jess’s outfit illustrated is how powerful a scarf, shawl, or even a piece of fabric can be at adding style to a look. 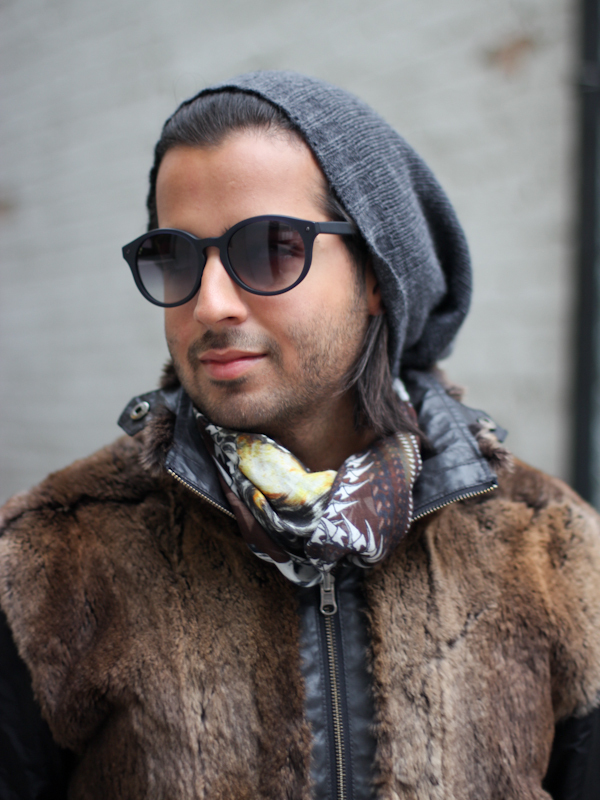 Scarves are an excellent way to add color, energy, and texture to winter looks. The streets are awash in navy, black, and camel coats because let’s be honest; when you’re dropping $$$ on outerwear you want a piece that goes with everything. I have to give Chicagoans credit though because you’ll see a lot more brightly colored coats (red, purple, green) here than anywhere else in America. So if you’re wearing a coat in a safe color like navy, add a brightly patterned scarf like Jess did to bring some style into your look! PS: Chambray denim shirts look great layered under wool outerwear like blazers and overcoats. They’re warm, too, since they add another layer of insulation against the hard Midwestern winter. 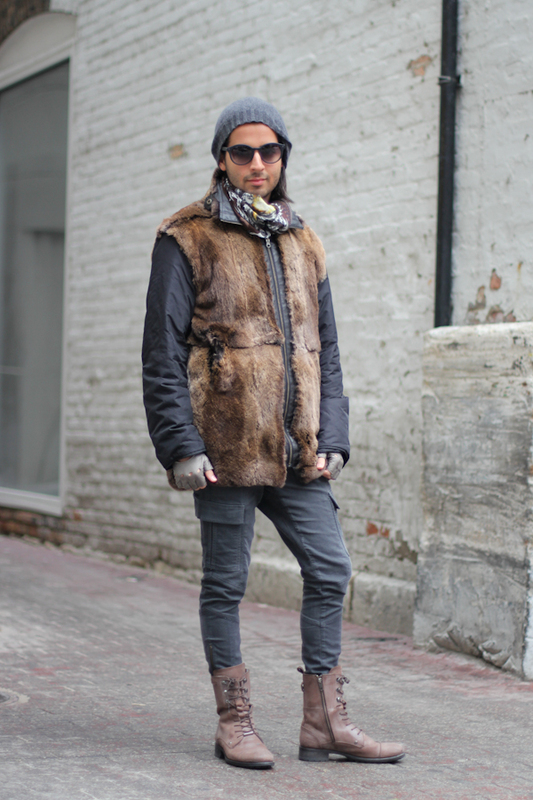 If you don’t want to don your puffy coat then this is a great look to try. I don’t feature enough men on this blog. It’s a problem I’ve been avidly trying to reconcile. The fact is that the majority of Chicago men don’t really understand how to dress well. The minority who dress very well I spot from time to time and I’m always elated to do so. Randy was waiting outside of the Burton store on Walton Street for his son to finish up shopping. I could use a crude acronym to refer to this extremely handsome father, but I’ll just childishly allude to it instead. I can’t help myself!